Bombardier Transportation and its local partner Hartasuma SDN BHD announced on 27 March that they will deliver an additional 27 Innovia Metro 300 trains for the Kelana Jaya Light Rail Transit (LRT) Line in Malaysia. The order from Prasarana Malaysia Berhad is valued at approximately 1.7 billion Malaysian ringgit (€359 million). The Innovia Metro 300 trains can move up to 30,000 passengers per-hour, per-direction. Once final delivery is completed in 2022, these highly efficient four-car trains will help to increase reliability and provide high capacity mobility on the Malaysian capital’s integrated transit network. Kuala Lumpur’s new fleet comes from the same generation of Bombardier Innovation Metro 300 trains which have been progressively entering service on the Kelana Jaya Line since December 2016. Since 1998 Bombardier has received three orders from Prasarana for a total of 374 vehicles. Final assembly and interior fit-out for these trains are all being carried out in Malaysia. In addition, the consortium is also increasing transport capacity on the same line through the conversion of the original Innovia fleet from 34 two-car to four-car trains with inter-car walkthrough and associated wayside system upgrade, to be completed by 2020. 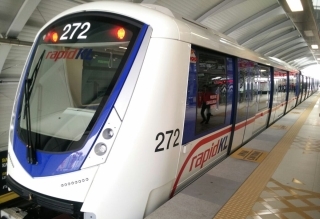 Bombardier is also currently delivering its Cityflo rail control solution for the first two lines of the new, fully-automated and driverless Klang Valley Mass Rapid Transit (MRT) system which will increase connectivity, including in and out of Kuala Lumpur, for an estimated 1.2 million residents.